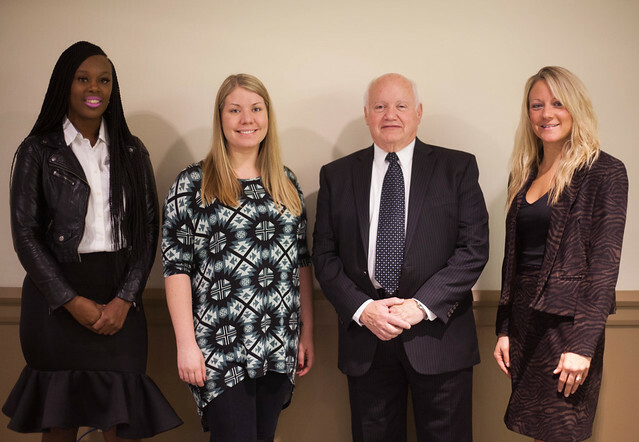 Graduate students Shannon Stowers, Erin Varga and Kayla Younge brought attention to current issues faced by the criminal justice field at the Fall 2016 Criminal Justice Administration Graduate Symposium held Nov. 17. Shannon Stowers: "Law Enforcement Agencies in Proportion to the Communities They Serve"
Erin Varga: "The Physical and Psychological Effects of Working as a Corrections Officer"
Kayla J. Younge: "Child Sexual Abuse Prevention: Obstacles and Solutions"
"The symposium provided the students with the opportunity to showcase their understanding of the challenges of the criminal justice profession," said Richard Linzer, J.D., associate professor of criminal justice and director of the M.S. in criminal justice administration graduate program. Symposium attendees included other Point Park criminal justice administration graduate students, criminal justice professionals, faculty, family and friends. "I chose my topic because of the Black Lives Matter movement and the police shootings of unarmed black men," explained Stowers, a graduate of Pittsburgh Oliver High School. When asked why she chose her topic, Younge from Elizabeth Forward High School in Elizabeth, Pa., said: "Working as a deputy sheriff in the criminal court system, I see multiple victims of child sexual abuse who have the strength to come forward and face their abusers in court." "These children inspired me to research a more effective means of protection for those children who may still be suffering in silence, as well as research a means of preventative education for children and adults alike," Younge added. Varga chose her research topic on corrections officers due to her related work as a bail investigator with Allegheny County Pretrial Services and her fiancee's position as an Allegheny County Jail sergeant. "Point Park University has provided me with the knowledge and resources I will need to further my career. The professors guided and encouraged me to learn research techniques and they taught me several tools I will need in my life going forward in the criminal justice field," remarked Varga, who graduated from Moon Area High School in Moon Township, Pa.
Linzer stressed the importance of attaining a master's degree in criminal justice administration for career success. "This level of academic success will aid in securing a career position as it indicates that the student is capable of performing complex work at a high level of competence," Linzer explained. Linzer added: "A master's degree may also result in a greater starting salary in an individual's career. For example, at the criminal justice career fair recently held at Point Park, recruiters from the Washington D.C. Metro Transit Police Department advised that newly hired officers with master's degrees start at a salary around 14 percent greater than the base starting salary." "This accomplishment means the world to me because I had to work extra hard for it. It's important to me because I want to show my 13-year-old daughter that she should never give up on her goals," Stowers said. Stowers added: "I currently work for the IRS. My goal is to transfer to the criminal division at the IRS or become a federal probation officer. Both positions require a master's degree. Point Park has enabled me to earn my master's degree and reach toward my career goals." Check out the career achievements of Point Park's criminal justice and intelligence studies graduates.